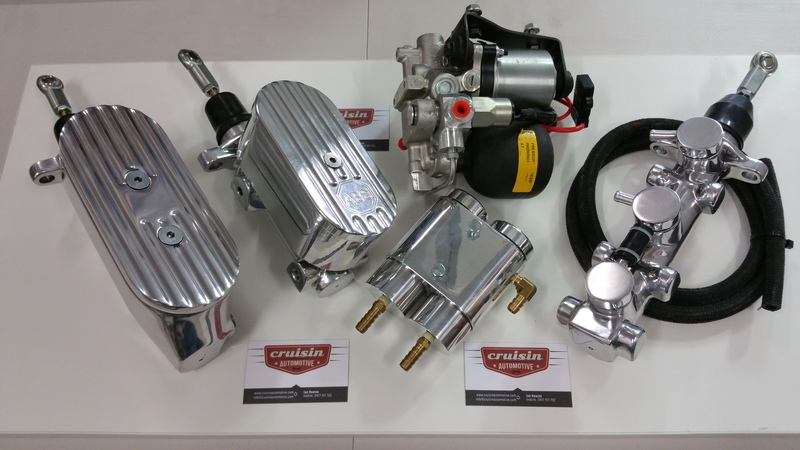 CRUISIN AUTOMOTIVE is the sole Australian agent for ABS Power Brake’s unique Electric High Power, Electric Brake Systems. These systems are designed to install easily, look great and perform even better. ABS Firewall Mount Part #10-56-9. 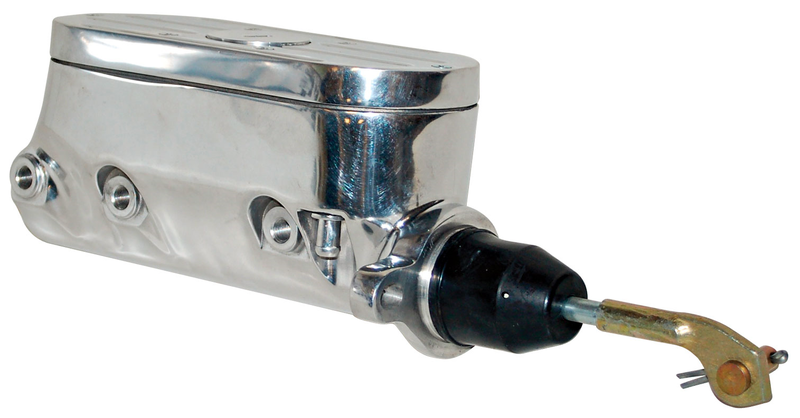 The master cylinder is designed to be a direct replacement for the factory master cylinder in nearly any application. 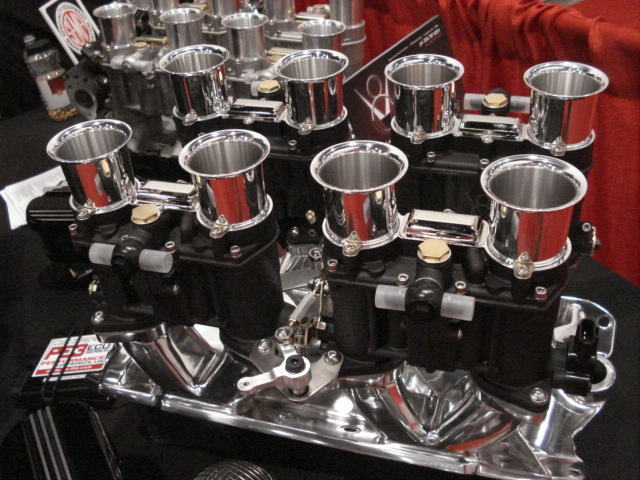 It looks great mounted on the firewall of any street rod, classic car, muscle car or hot rod. We also offer new brackets to add an under-dash or under-floor pedal to nearly any vehicle. The system requires no engine vacuum. This means that engines with aggressive camshafts, superchargers and turbochargers can now have a power brake system that outperforms any on the market without a noisy vacuum pump. The system includes a compact electric power supply which is the source of the boost for the braking system. Measuring only 8″ x 6″ x 6″ this unit can be hidden anywhere in the vehicle, in any orientation, just so long as it is below the brake fluid reservoir. 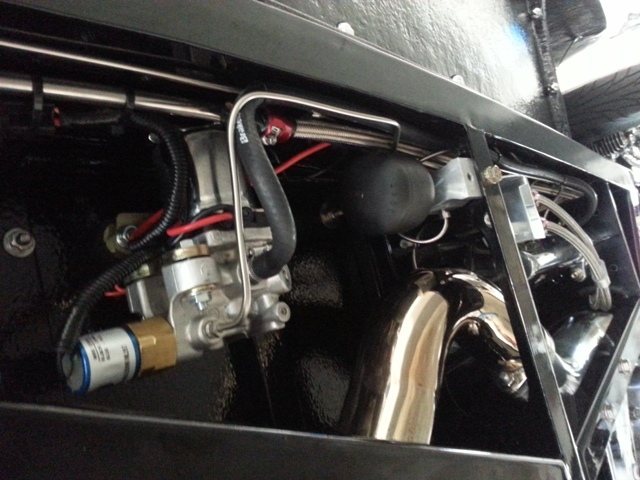 It has two hydraulic connections, the gravity feed from the reservoir and the high pressure assist line that gets plumbed back to the port on the master cylinder with the accumulator inline. 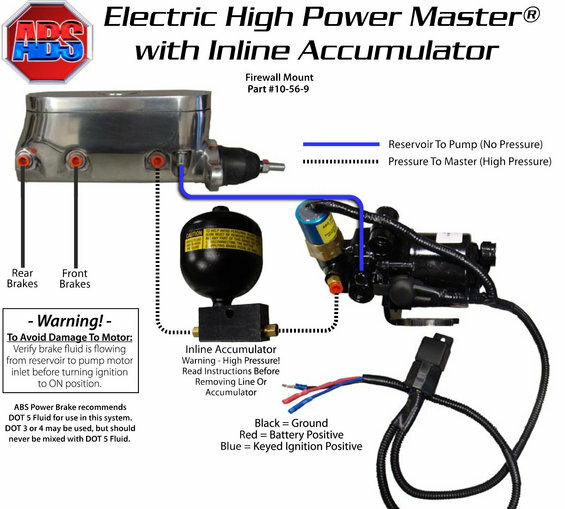 The integral pressure switch and relay come pre-wired, requiring only a ground, a battery connection and a keyed ignition connection. The whisper quiet power unit draws 14 amps at maximum pressure and is quieter than most aftermarket electric fuel pumps. We designed the system with performance and safety in mind. The use of a 1- 3/16″ bore means we can provide enough fluid for even the most complex systems with multi-piston calipers, while still being able to create 1600-1800 psi brake line pressure during normal operation and over 2000 psi at maximum output. The boost circuit includes a hydraulic accumulator which works like a capacitor does in an electrical circuit. It stores up the pressure and allows for a very smooth actuation of the brakes. It also provides a reserve of pressure to assist the brakes in the event of a failure of the vehicle electrical system. You will have 10-15 full-assist stops before the pedal slowly starts to get harder as the pressure drops in the boost circuit. If you get to zero pressure on the boost circuit you will then have manual brakes. Designed to O.E.M. standards, we recommend DOT5 silicone based brake fluid, but the system willwork perfectly with DOT3 or DOT4 if being added to an existing system. We use NAPA Brand DOT5 fluid for all new systems installed at our shop. You will always have brakes. 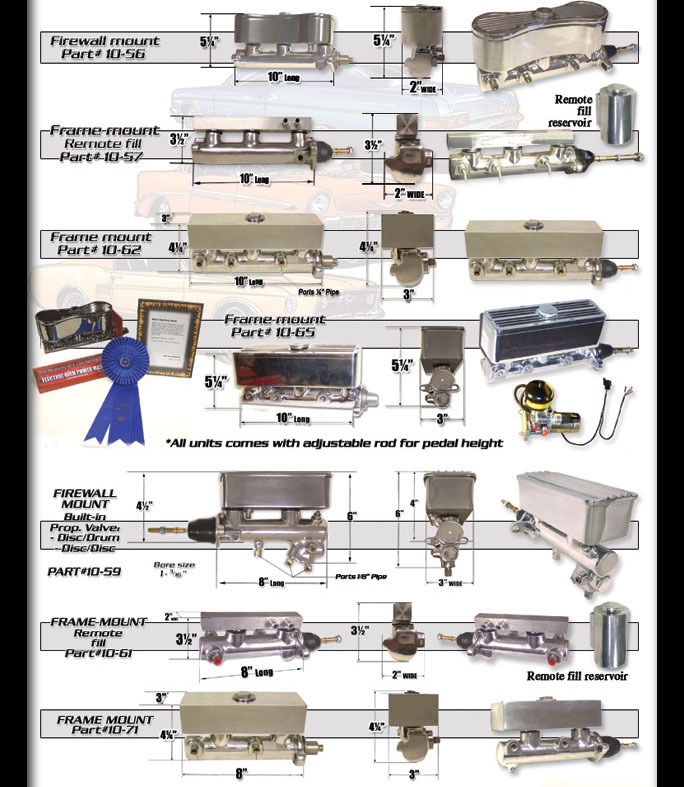 We carry the 1056-9, 10-57, 10-66 and 1056 Electric Brakes Systems in stock. CRUISIN AUTOMOTIVE INSTALLS ELECTRIC BRAKES INTO YOU CAR, IF IT BE A HOT ROD, CUSTOM, AMERICAN MUSCLE CAR OR AUSTRALIAN MUSCLE CAR. Picture of the Eightstack injection.